Through June, air temperatures and sunlight were higher than normal. Recent rain generally improved river flows. However, the Fraser river flow remains extremely low, reducing water exchange with the ocean. Water temperatures are still breaking records, yet dissolved oxygen levels are normal. Coastal bays are influenced by upwelling and exhibit lower oxygen and higher salinities. Puget Sound algae are thriving with blooms observed in many South Sound inlets. Macro-algae is seen piling up on beaches and drifting in Central Sound. Jellyfish smacks are numerous in Eld and Budd Inlets. Our fliers notice seals hanging out at the beach! Description Through June, air temperatures and sunlight were higher than normal. Recent rain generally improved river flows. However, the Fraser river flow remains extremely low, reducing water exchange with the ocean. Water temperatures are still breaking records, yet dissolved oxygen levels are normal. Coastal bays are influenced by upwelling and exhibit lower oxygen and higher salinities. 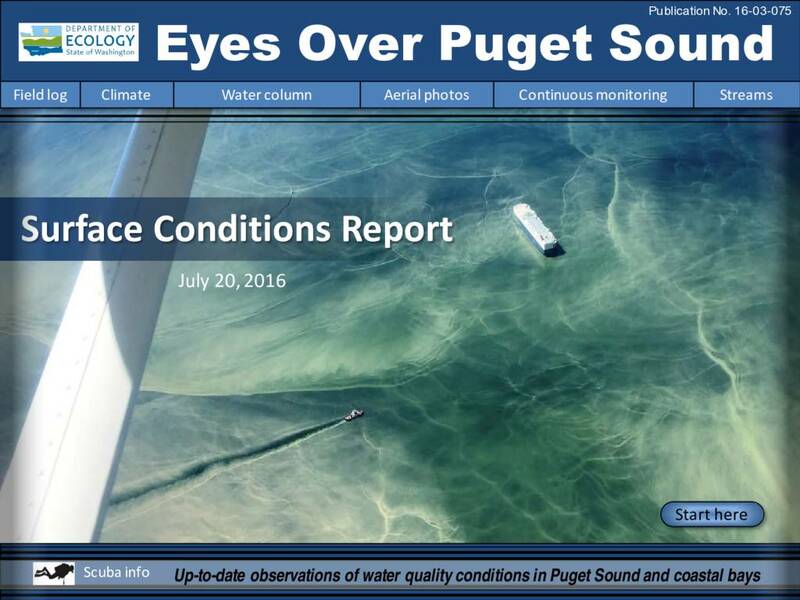 Puget Sound algae are thriving with blooms observed in many South Sound inlets. Macro-algae is seen piling up on beaches and drifting in Central Sound. Jellyfish smacks are numerous in Eld and Budd Inlets. Our fliers notice seals hanging out at the beach!